Commission Regulation (EU) no. 715/2013 of 25 July 2013 establishing criteria determining when copper scrap ceases to be waste under Directive 2008/98/EC of the European Parliament and of the Council. 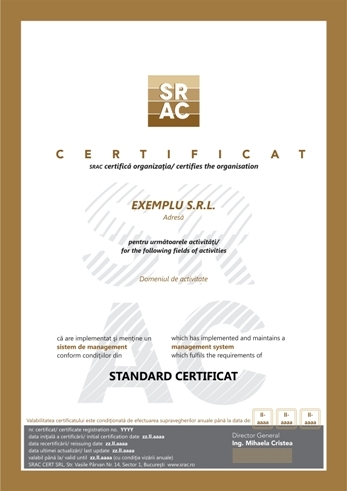 SRAC can certify a management system in compliance with Regulation (EU) no. 715/2013, because, in compliance with requirements of art. 5, point (5) of this Regulation, it is accredited as EMAS verification body, in compliance with Regulation (EU) no. 1221/2009 by RENAR. have the right to issue for every transport of copper scrap, a conformity declaration in compliance with Annex II model of Regulation no. 715/2013, that confirms that the respective copper scrap, fulfills the criteria expressed in Regulation (EU) no. 715/2013. establish criteria determining when copper scrap ceases to be waste. Those criteria should ensure a high level of environmental protection.